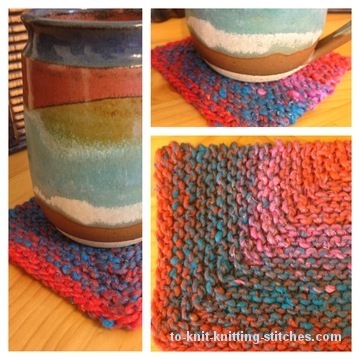 Mitered Coaster - An Easy Knitting Project in less than a day! Mitered Coaster - Be careful you might get addicted! I've always wanted to knit this type of square called "mitered square". It named after mitered saw, a saw used in cutting a perfect angle for making frame and other types of wood work. This type of square is done by knitting double decreases at the center of work. 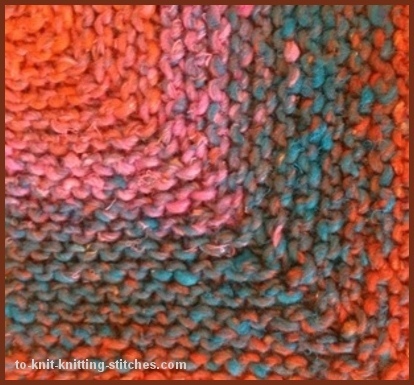 The piece will form into square as you knit your way to the tip of it. At a half way point you will see a rectangle shape forming. 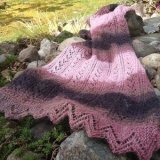 This looks pretty much like a little shawl. In facts, many shawls are knitted using similar technique to this mitered square. Once you have knitted half way of the piece, it will become narrower and narrower and until you come to the final 2 stitches. After binding off the last 2 sts, you're done! Image 1: Closeup image of Mitered Coaster knitted with variegated Noro yarn - a mixture of silk, cotton, nylon and wool. Love that Noro yarn! I like the way my mitered coaster turned out. Nice even enough square and not too perfect like machine made. I will definitely make several more to add to my coaster collection. I am already making an octagon coaster with the same yarn just for the fun of it. 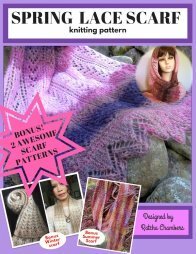 Yarns that work best for this project are those with variegated colors. The plain color yarn would work, but it won't be so interesting thought. Image 2: Turning mitered square into a coaster is pretty nice thing for me since I always look for one when I drink my tea or coffee. I think I'm just going to knit a lot more and leave them all over the house! These are yarn gauge and finished measurement of my coaster in the pictures above. You don't need to worry to much about the gauge. Just use the needle that suggested by the yarn you use. Finished measurement: 4.5" x 4.5"
1. A ball of variegated yarn in worsted weight (or left over yarn). Cotton work best for a coaster that is used for cold drink because it absorb water best. Row 1 (wrong side): K 18, PM (place marker), K to end of row. Row 2 (right side): Knit to 2 sts before marker, k2tog through back loop (or slip slip knit if preferred), slip marker, k2tog, k to end of row. Repeat row 2 and 3 until you have 2 sts left. Next row: Slip 1, k1, psso. Cut yarn and end off (pull the last st until whole tail of the yarn go through the loop. Use tapestry needle to weave all ends behind work. Block if you want to.